In the G/6 hangar “Balloon”, in the north of the aerodrome, “Ballonville Pilote” (pilots area) is the gateway to the launch field. Pilots and crews are welcomed in a friendly and relaxing atmosphere. Pilots reception, briefing, breakfast area, shops, makers stands, repair station, exhibitors, toilets, bar, restaurant, are available for a perfect stay. We will be at your service to answer all your demands. Don’t hesitate to come back after your registration, the present team will be happy to talk to you. Included in your registration: every morning from 5:15 am until 7:00 am, enjoy your breakfast with direct access to the briefing. 5:45 am and 6:00 pm. Please refer to the program for schedules of special briefings. The land is protected by an air show order and TRA (Temporary restricted area). Only the Flight Director will give the permission to enter. The aerodrome frequency is 119.55. Wearing a badge or wristband is required to access “Ballonville Pilote” and the launch area. You must put the pass on your vehicle which will have to access on the airfield. There will be no replacement if lost. Let’s enjoy a larger propane station, unique in Europe! The Gas Station is located near the Chapel in the south of the base. Access is strictly pedestrian and pilots conduct filling operations themselves, under the supervision of expert technicians. With very few exceptions, refueling hours are as follows: from 08:30 am to 11:30 am, and from 08:30 pm to 11:30 pm. On July 26th : 1:00 pm to 4:00 pm and from 8:30 to 11:30. CAREFUL: if the flight director cancels a flight, it is forbidden to enter, take off, land, fly, and fly over the TRA. If a flight is cancelled, the gas station is closed. The purge of the gas cylinders for balloons travelling by plane or boat will take place on August 2nd, 3rd, 4th, 3rd & 5th from 2:00 pm to 5:00 pm. Booking at registration is mandatory. IT IS STRICTLY FORBIDDEN TO VENT UNRESTRAINEDLY GAS FROM YOUR CYLINDERS ON THE FIELD. 19 flights are scheduled on the event 10 days. Morning and evening flight, both lighthouse moments of the day on Grand Est Mondial Air Ballons®. At this time the weather is splendid in our region. The opportunity to do very beautiful flights. On this website you will find all the information about #GEMAB19. Find the link to download it here as soon as it will be available. The Aérofil is the journal of Pilatre de Rozier Organization. In this journal, our reporters offer you a 360° look on our activities and of course on Grand Est Mondial Air Ballons®. 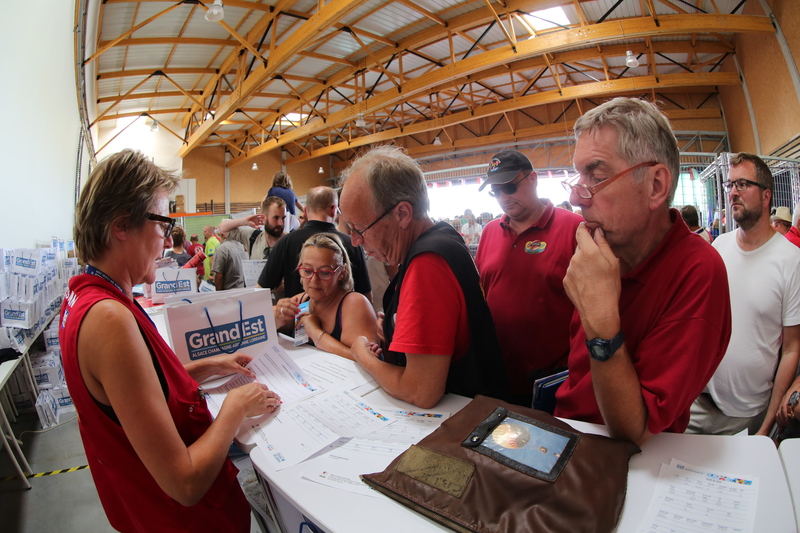 The different BallonVilles (pilot, public, partner, organization), anecdotes, pictures and drawings… so much information that interested all the participants of the event. You will receive at home, the copy published before the event. During the gathering, it is made every night by Pilâtre de Rozier team and will be distributed every morning at pilot desk and other places. On Grand Est Mondial Air Ballons® we have our own radio happily named Good Morning Chambley. From July 26th to August 4th 2019 near the Chambley Aerodrome zone, connect you on the 98.2 frequency to know the event actualities, listen reports, follow the animations, participate to lots of games or enjoy a musical break!